Robot Snakes to Explore Mars? The recent discoveries and accomplishments of the Curiosity and Opportunity rovers have been very impressive. But for some, these successes have overshadowed the limitations that are part of the rover designs. Yes, despite their complexity and longevity (as evidenced by Opportunity’s ten years of service) the robot rovers really aren’t that fast or agile, and are limited when it comes to what they can access. Case in point, Curiosity is currently on a year-long trek that is taking it from the Glenelg rocky outcropping to Mount Sharp, which is just over 8 km (5 miles) away. And where crevices, holes and uneven terrain are involved, they’ve been known to have trouble. This was demonstrated with the Spirit Rover, which was lost on May 1st, 2009 after getting stuck in soft soil. As a result, the European Space Agency is planning on a sending a different type of rover to Mars in the future. Basically, their plan calls for the use of robot snakes. This plan is the result of collaborative study between the ESA and SINTEF – the largest independent research organization in Scandinavia – that sought to create a rover that would be able to navigate over long distances and get into places that were inaccessible to other rovers. They concluded that a snake-like robot design would open up all kinds of possibilities, and be able to collect samples from areas that other rovers simply couldn’t get into. 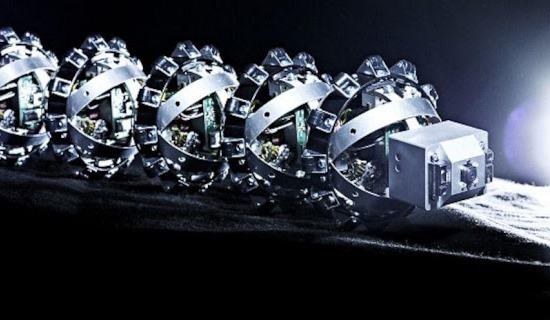 In addition to being able to move across challenging surfaces, these snake-bots would also be able to tunnel underground and get at soil and rock samples that are inaccessible to a land rover. 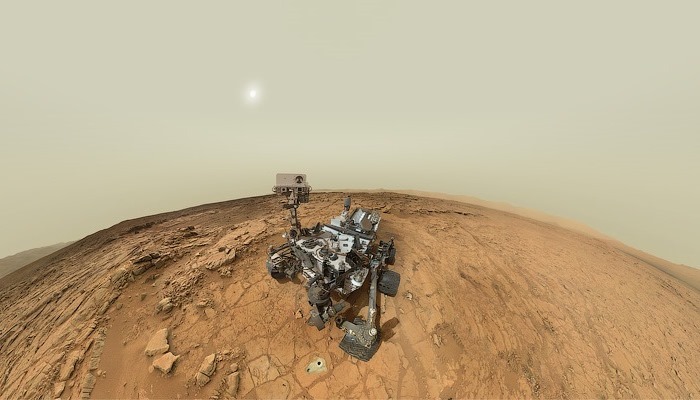 Curiosity, which despite its advanced drill, is limited in what it can examine from Mars’ interior. 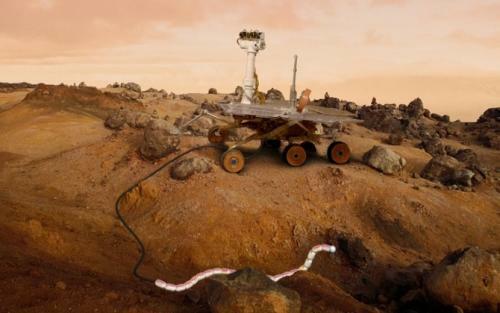 The researchers envisage using the rover to navigate over large distances, after which the snake robot can detach itself and crawl into tight, inaccessible areas. A cable will connect the robot to the vehicle and will supply power and tractive power – i.e. it can be winched back to the rover. Communication between the pair will be also be facilitated via signals transmitted down the cable. We are looking at several alternatives to enable a rover and a robot to work together. Since the rover has a powerful energy source, it can provide the snake robot with power through a cable extending between the rover and the robot. If the robot had to use its own batteries, it would run out of power and we would lose it. One option is to make the robot into one of the vehicle’s arms, with the ability to disconnect and reconnect itself, so that it can be lowered to the ground, where it can crawl about independently. An additional benefit of this rover-snake collaboration is that in the event that the rover gets stuck, the snake can be deployed to dig it out. Alternately, it could act as an anchor by coiling itself about a rock while the rover using the cable as a winch to pull itself free. Liljebäck and his colleague, Aksel Transeth, indicate that SINTEF’s Department of Applied Cybernetics has been working closely with the Norwegian University of Science and Technology’s (NTNU) Department of Engineering Cybernetics for many years. However, it was only recently that these efforts have managed to bear fruit in the form or their robot snake-rover design, which they hope will trigger a long-term partnership with the ESA. In addition to researching rover design, Transeth, Liljebäck and other researchers working with the ESA are looking for ways to bring samples from Mars back to Earth. At present, soil and other materials taken from Mars are analyzed on board the rover itself, and the results communicated back to Earth. If these samples could be physically transported home, they could be studied for years to come, and yield much more fascinating information. The researchers are busy working on a feasibility study assigned to them by the ESA. The ESA and the researchers believe that by combining a rover that can navigate over large distances with a snake robot that can crawl along the ground and can get into inaccessible places, so many more possibilities could be opened up. Robot snakes…sounds like something from the 3rd Transformers movie and the 4th Terminator film, wouldn’t you say? Think about them! They’re both probably going to appear in the Independence Day sequel because there are no new ideas in Hollywood! All the more reason to avoid them all! Didn’t like T4 and couldn’t stand Transformers 3. And just the thought of Roland Emmerich imitating the lesser Bay makes me want to hurl! Bathroom’s down the hall and to your right. A snake by any other make is still slithery!